Greater Noida (10/02/2019) : The Little Engines Play School inaugurated at ACE city Greater Noida West. Ace City Greater Noida has more than two thousand flats in which mostly young professionals are residing, the society is strategically located in Greater Noida West. Today, The Little Engines Play School was inaugurated, it is managed by a senior primary educationist Mrs Anju Kohli, she has been running a Blooming flowers play school in sector Beta-2 for the last fourteen years, Mrs Kohli is very passionate about nurturing the tiny tots for their all round development. 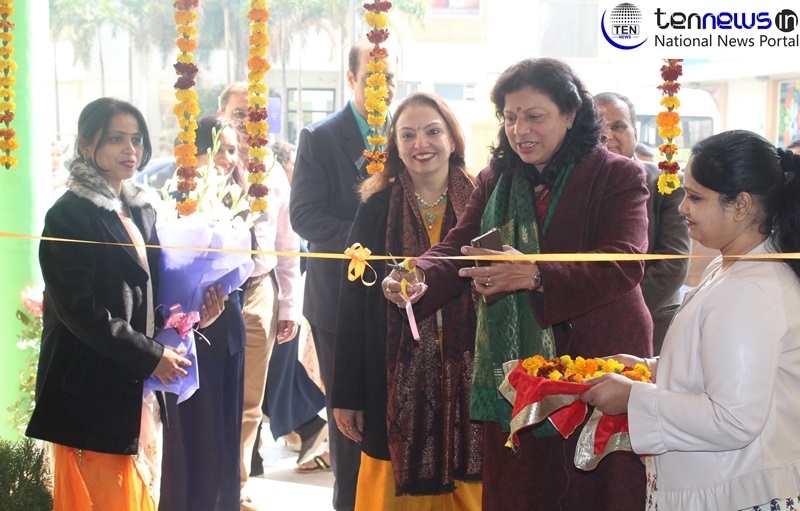 Mrs Renu Chaturvedi senior educationist and principal of DPS, Greater Noida inaugurated by cutting the ribbon and lighting the lamp on the occasion of Basant panchami. Mrs Chaturvedi took a round of the school and appreciated play school’s theme and design particularly the interior decoration. “I think it’s a matter of great pleasure to be here, well this area is our area, this is greater noida west and another school which is going to be stepping stone for quality education for children is here, i think a great step has been taken towards the promise that we have to give to you, the continuation of quality education, Little Engines is beyond my expectations which is beautifully well designed block. I am happy to see Mr. Gajanan Mali, who is also guest, he knows about the growth of Greater Noida perhaps who knows better than him, he has been recording the growth of quality education in this area” , said Renu Chaturvedi. On this occasion tiny tots performed dance performances and also did a ramp walk with their mothers . Large number of young professionals and parents were present to enjoy the cultural bonanza and wonderful performance of their kids. Mr Sanjay kohli, Gajanan Mali, Naveen Arora and large number of young ladies were present at the inauguration ceremony.